Chris Nash's quickfire century gave Sussex the edge against Essex on day one of their Championship game at Hove. The 32-year-old and Ed Joyce shared an opening stand of 188 before Joyce was caught behind off Ryan ten Doeschate. Sussex faltered as Nash fell lbw to Ten Doeschate for 119, including 21 fours, and Ross Taylor feathered one behind the stumps off Graham Napier. 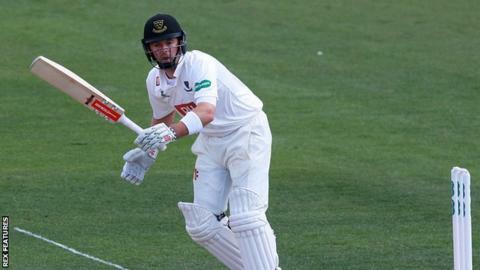 Ollie Robinson hit 51, just his second first-class half-century, to propel Sussex to 355-8 at the close of play. Sussex paid tribute to their former fast bowler Matthew Hobden before the match, with a tree planted in memory of the player, while team-mates wore shirts with the number 19 and Hobden on the back in his honour.